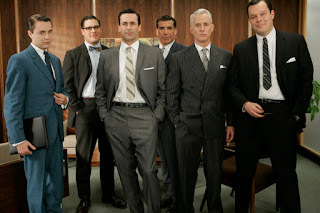 The Raving Queen: Girls, I Am Telling You, "Mad Men" Has Altered Men's Fashions!!!!!!!!!!!!!!!!!!!!!!!!!!! Girls, I Am Telling You, "Mad Men" Has Altered Men's Fashions!!!!!!!!!!!!!!!!!!!!!!!!!!! With all this talk of Prada, and Lauren's new book, which cover fashion in the women's territory, I began wondering about my own gender--men. And the news is not great! "Mad Men" has certainly, as a result of its success, had an influence on men's fashions--but not in a good way!!!!!!!!!!!! Some of us, darlings, like some color and variation in our wardrobe! "Mad Men" has brought everything back to drabness--grey, blue and black! Try finding something colorful on the racks now! You practically have to go to places like Trash Vaudeville in the East Village, to find anything remotely bright! The "Mad Men" cast may look great in this photo, and on their show, but, honestly now, do you really want to dress like that, today?????????? I, for one, cannot imagine why! Walking down the street, you would look as though you were auditioning for a role in a Scorsese gangster movie, or had just come from a funeral!!!!!!!!!!!!!! Gentlemen, I am telling you, here and now, whether you are still in, or out of the closet, or for those for whom it does not matter, it is time for all of you to return to YOUR closets, and examine your ware! One thing you have to give these young Social Networkers--they are not afraid to stylistically self-define themselves!!!!!!!! And neither should you!!!!!!!!!!!!!!! Don't be drawn back into the days of repressed conformity as a result of "Mad Men." Be individualistic enough to express yourselves as brightly and boldly, as you can!!!!!!!!!!!!!! Before you know it, you will feel like Marilyn Monroe and Jane Russell!!!!!!!!!!!!!!! !